Amazon sponsored product ads is Amazon’s own internal pay per click advertising platform. The system works like other PPC systems such as Google Adwords in as much as advertisers bid on different keywords to be shown when a customer runs a search query. The bidding process is much like an auction but whereas in a regular auction the winner would be the person that bid the highest price, in the case of Amazon other factors are also taken into account. We have spoken previously about Amazon wanting to maximize revenue per customer RPC, so Amazon basically wants to show ads for products it thinks are highly relevant and ones that have a high conversion rate and are likely to lead to a sale. When starting an Amazon PPC campaign its important to get the structure right from the beginning. Below is the structure we recommend. Manual/Winners campaign – all keywords entered in broad, phrase and exact match. We start this immediately that the product goes live on Amazon. In an auto campaign we don’t enter keywords to bid on instead Amazon chooses keywords for us that it thinks are relevant. We initially like to start the auto campaign at a reasonably high bid and daily budget. Its important to realize that in the early days of any PPC campaign, all we are really doing is buying data. As well as the auto campaign we also like to start an expansion campaign as soon as the product is launched. In this campaign we will add all the major and minor keywords we discovered during our keyword research phase (link to keyword research post) in broad match. As you would have learnt from the post about match types, broad match is likely to trigger many search terms variations and long tail keywords. Again the early stages we are buying data which will later be used in the optimization process. Before getting into optimization I would like to mention an little about keywords and search terms as it very important to realize the difference when we start analyzing the data. A keyword is the word of phrase that we enter to bid on, whereas the search term is the actual term typed in by the customer in the search bar. This is easier explained in an example. So keywords in broad match generate many variations of search terms. Ok with that out the way lets talk about PPC Optimization. Unfortunately this is not a one time task but rather an ongoing process. In very basic terms we want to stop keywords or search terms that are being clicked but are not resulting in sales and therefore losing us money. In some situations certain sellers may be willing to lose money on certain keywords for such purposes and brand awareness or because they consider highly relevant to their product and they want to be seen when some searches. But in general most sellers want to run campaigns that don’t lose money instead rather generate some sales at a profit. In the optimization process one of the most important metric is ACOS or advertising cost of sale. This is the percent of attributed sales spent on advertising. This is calculated by dividing total ad spend by attributed sales. For example, if you spent $4 on advertising resulting in attributed sales of $20, your ACOS would be 20%. So when we are looking at ACOS we should be aiming a number, which is lower than our profit margin. Depending on initial budgets and bids with 2-4 weeks we should have enough data to begin optimization. Up until a year or so ago PPC optimization was a very complicated process, it still can be very daunting but there are now tools available to help. Previously optimization would require downloading various search term reports from Seller central and then manipulating the data in Excel sheets, to find our search term and keyword data. It was very time consuming and somewhat confusing. Brian Johnson, founder of the Sponsored Products Academy (the best PPC training available) and also the creator of PPCScope software is probably the foremost authority on Amazon PPC on the planet. Its been my pleasure to study with him both through his course and in one on one consultations. 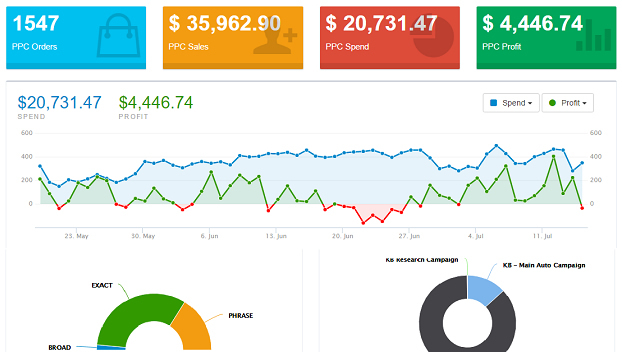 His application PPCScope is now my go to tool for managing PPC accounts, the software is connected to your seller account and so now all the reports we previously had to download are now available from within the application. Now the optimization process is quite complex but I will try to cover it here in broad strokes. Usually the first step is to kill off what we refer to as Toxic Keywords. These a keywords that are getting click and therefore costing money but have resulted in zero sales. When consider this we need to have enough data to establish statistical significance, that means that if a keyword has only had 2 or 3 clicks, then statically speaking there is not enough data to decide if it really is a toxic keyword. I usually like to see between 5-8 clicks with out a sale before I make a decision. The way to stop these toxic keywords and search terms is add the term as what we call a negative match keyword. When a negative match keyword is entered at campaign or ad group level it will suppress that keyword from triggering an ad impression, so it will not show in search results. We predominately add negative exact match keywords at ad group but if we seen a trend of toxic search terms all containing a certain phrase we would then add this as a negative phrase match keyword at the campaign or ad group level. This process of killing off toxic keywords and search terms is the easiest way to quickly stop wasted ad spend. After running the auto campaign for some weeks we will take a look at performance and make a decision to either stop it or keep it running. If it’s showing a good ACOS we will leave it running but keep a good eye on it. If the ACOS is to high then we stop it. Before shutting it down though we will go through the report to find profitable keywords which we will then move into our broad match expansion campaign. The next optimization step is to look at unprofitable keywords; these are keywords that are getting sales but a very high ACOS. So for example is our target ACOS was say 28%, we would look at all the keywords with high ACOS and make a decision on whether lowering the bid might potentially make the keyword profitable or if the ACOS is really to high we may decide to lower the bid right down to point where we have effectively paused the keyword as it will not receive any impressions. When making this decision we also take in account conversion rate and also RCPC or recommended cost per click, which the cost where we calculate the keyword would be profitable or at least breakeven. So for example if a keyword has an ACOS or 125% then we know it will be very difficult to make this keyword profitable. On the other hand if the ACOS was around 50-65% (perhaps a little more in some cases) then it may be possible to slowly lower the bid in increments until we reach a point and achieve our target ACOS. Once we get the campaign basically optimized and remember this is not a one time job, but rather and ongoing weekly activity. We then need to start looking to expand and look for more potentially profitable keywords. Initially we look at the existing expansion campaign we set up at the beginning and any profitable keywords will then be moved to the manual/winners campaign, in all the three match types. The reason we add these profitable keywords into the manual campaign in broad, phrase and exact match is that some keywords will perform better in certain match types and it’s impossible to know which without testing. We then also begin adding additional keywords to our expansion campaign in broad match. We do this in groups of around 50 words as each time we do this expansion we must expect there to be words that will lose us money. So we let the new keywords run until we have enough data to optimize and we follow the same process of then moving profitable ones to the manual/winners campaign. Through this constant optimization, adding new keywords, and then further optimization we start to collect only profitable keywords and the expansion is helping us to find a few more each time we add new keywords. As you can ses it is a rather complex process but PPC can be a terrible waste of money if not properly setup and run. AmzAccess offers a Professional PPC Management Package at a very reasonable cost. If you would like to stop wasting money on your PPC campaigns then let us help! Click here for more details.